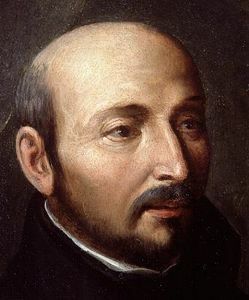 A quick perusal of Jesuit sites will find any number of ways Ignatian devotees are observing the founder’s feast today. Me, I have a nursing home prayer service to lead in less than two hours. Mass tonight with the students. In between, a full day of ministry at the parish. Yesterday I picked up yet another commentary on the Spiritual Exercises. I have no idea how good it is. I also need to complete a grant request for funding for next summer’s graduate studies. Any Ignatian-leaning believers out there planning anything special? This entry was posted in Saints, spirituality. Bookmark the permalink.